Pattie, Donald. "Black Bear". The Canadian Encyclopedia, 25 May 2017, Historica Canada. https://www.thecanadianencyclopedia.ca/en/article/black-bear. Accessed 23 April 2019. The most common and widespread bear in Canada, the black bear (Ursus americanus) is found predominantly in forests of every province and territory, with the exception of Prince Edward Island. Nearly all eastern North American black bears are jet black, often with a white chest patch. Frequently in western and southern ranges, individual bears may have coats that are blond, cinnamon, light or dark brown, or variations and mixtures of these colours. Bluish-tinged bears live along the coastal St. Elias mountains of British Columbia and adjacent Alaska. 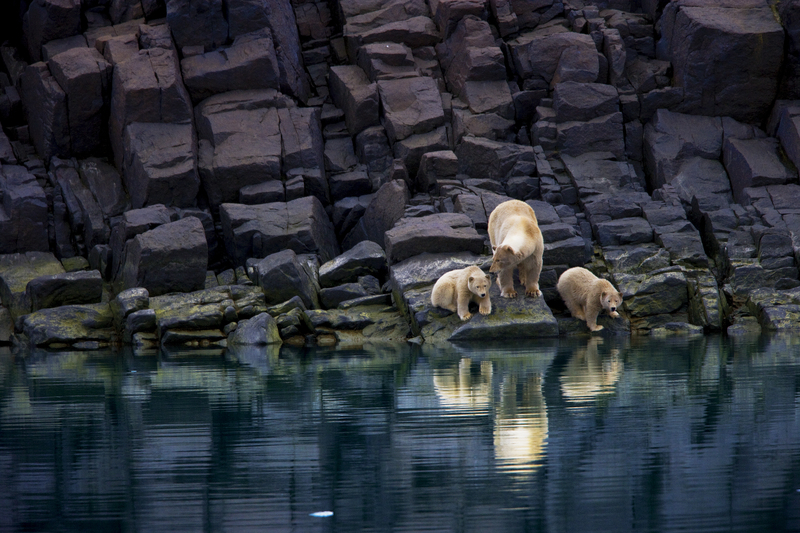 White to cream-coloured bears inhabit some coastal islands and the adjacent mainland of BC, but are less common. Adults are usually 150–180 cm long from nose to tail, and approximately 90 cm from foot to shoulder when on all fours. 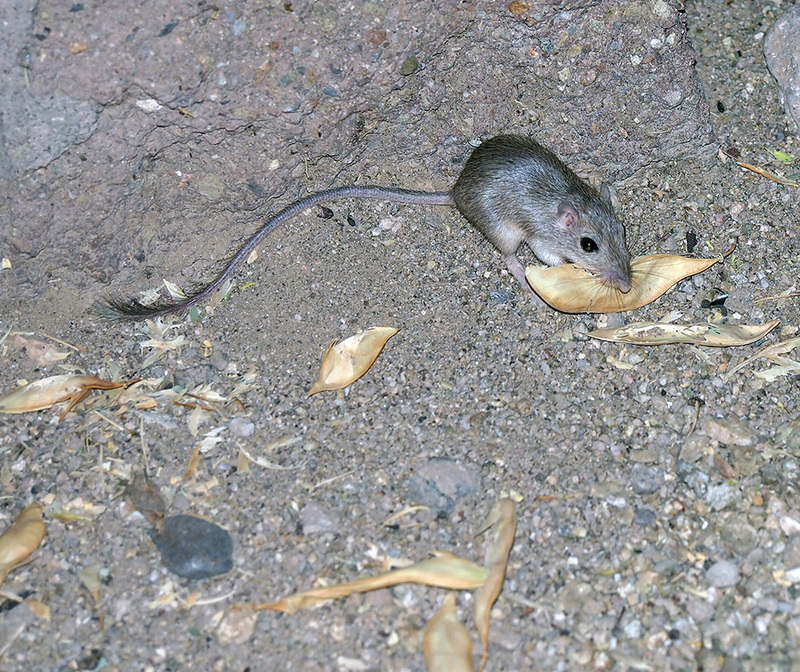 Tail length is about 12 cm. 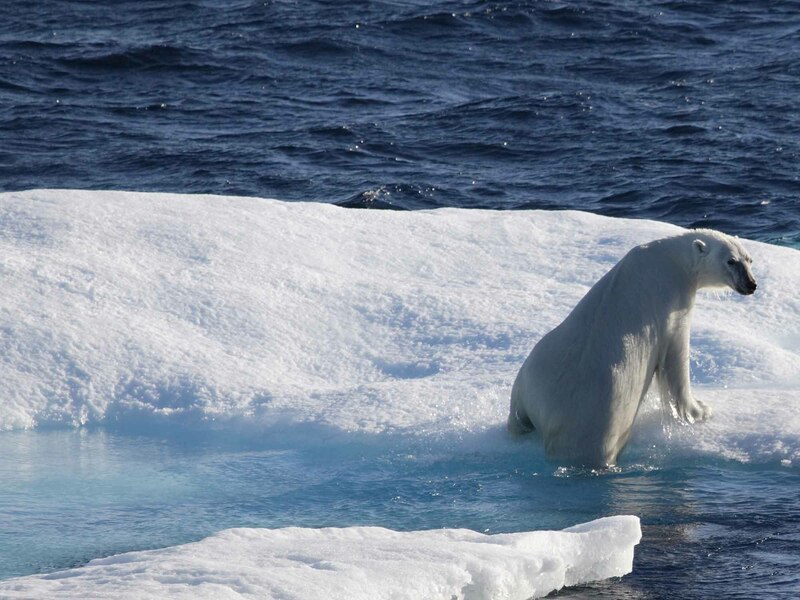 Males usually weigh 115–270 kg, females 92–140 kg. Sharp, curved, black claws enable black bears to climb trees easily. Their regular gait is usually a lumbering walk, but they can run about 45 km per hour and also swim well. 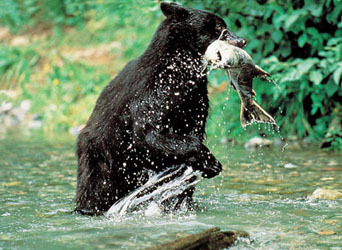 Black bears tend to be most active at night, but may feed or travel at any time. In wilderness areas, the diet of the black bear is about 95 per cent vegetation and about 5 per cent insects, mammals and birds. These percentages can vary dramatically when the bears come in contact with humans. Then garbage, grain crops, honey bees and even domestic livestock may be consumed. The mating season extends from June to mid-July. The developing embryo does not implant until autumn, and embryonic development lasts only 10 weeks. The birth of one to three naked, blind cubs occurs during the hibernation period of January to February. The female does not emerge from the den until the cubs' eyes open and they can follow her. Vocalization of the cubs often consists of shrill howls; adult bears more often "woof." Black bears can live to between 20 and 30 years of age. Black bears do not truly hibernate but enter a state of lethargic sleep. They become fat with the approach of cold weather and sleep for about 125 days, beginning as early as October and extending into May (shorter in warmer climates). Body temperature drops from 38°C to 31–34°C, respiration slows and the metabolic rate declines. Sport hunting black bears is legal in Canada. 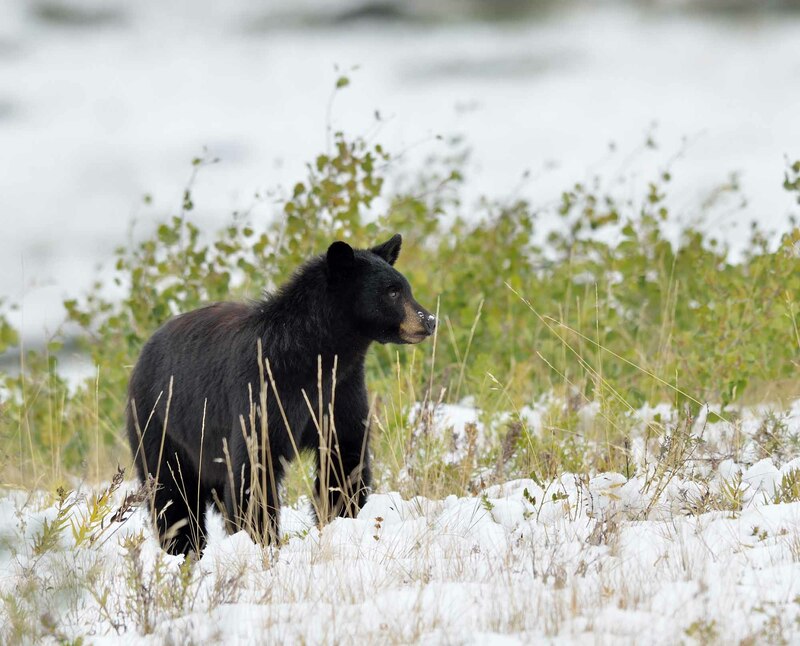 Though not considered a threatened species, as human populations encroach on black bear habitat there is increased risk of bears coming into contact with humans. 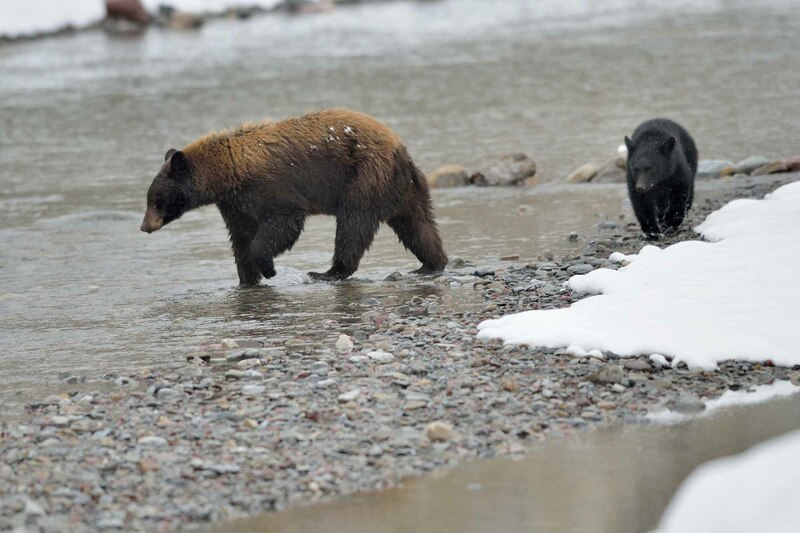 These instances generally occur when regular sources of food are scarce, prompting black bears to wander in search of substitutes such as garbage.